Definition of Pterygium, Symptoms, Causes, Diagnosis, Treatment, and Prevention; Pterygium is an eye disease characterized by the growth of membranes on the surface of the eyeball. This eye condition can occur in one or both eyes at once. Diseases including non-cancerous lesions rarely cause dangerous complications. But if it continues to grow and is not treated, the pterygium can spread to cover the pupils of the eye so that it disturbs the vision of the sufferer. Irritation, itching, or sore eyes. 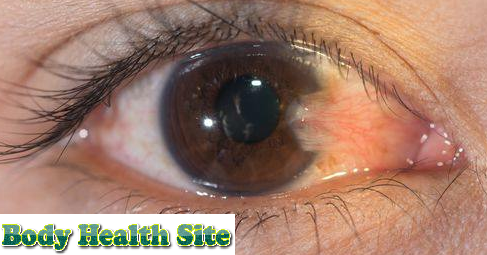 It feels that there is a lump in the eye if the pterygium membrane is thick or wide. Consultation with a doctor should be done if someone experiences these symptoms. Early examination and treatment will reduce the risk of complications. The cause behind pterygium is not yet known. But this condition is more common in those who often do outdoor activities. Exposure to sunlight, dust, smoke, and wind is thought to potentially increase the risk of pterygium. Dry eyes are also thought to be a trigger factor. Pterygium can be detected by a doctor through its main symptoms, namely the growth of a thin membrane on the surface of the eyeball. The doctor will also undergo a more thorough eye examination to ascertain the patient's eye condition. If needed, the doctor will do a more detailed examination. This examination is used to measure the ability of vision and check changes in the curve of the cornea of the patient. From the results of the examination, it will be known the severity of the pterygium suffered by the patient. This condition generally does not require special handling if classified as mild and does not interfere with vision or comfort of the eyes. However, patients are still advised to undergo regular eye examinations to monitor their progress. But if the pterygium has blocked the eye field of view or disturbs comfort, it can be dealt with by prescribing medicines according to a doctor's prescription or by surgery. The use of drugs, such as eye drops that contain steroids and lubrication, can be done to prevent inflammation or to relieve symptoms. If medication alone is not enough, surgical removal of the pterygium membrane can be done. Patient's visual ability is threatened to decrease. After surgery, patients will be given drugs to reduce the risk of complications, as well as to prevent recurrence of pterygium. In addition, monitoring the patient's eye condition will also be carried out for about 1 year. Patients are advised to avoid exposure from the surrounding environment, such as sunlight, smoke, or dust that can trigger the pterygium. For example by wearing sunglasses or hats when traveling. This is useful for preventing pterygium or recurrence. 0 Response to "Definition of Pterygium, Symptoms, Causes, Diagnosis, Treatment and Prevention"